Vega flight VV10 was initiated from the launch pad in Kourou. On the top of the rocket, protecting the two satellites, a new RUAG Space payload fairing debuted, one that was manufactured out of autoclave. This advanced process was — for the first time— applied for the payload fairing of a Vega rocket, after having succeeded initially on an Ariane 5 five weeks ago. The new RUAG fairing, photo courtesy of the company. The new procedure reduces both throughput time and cost, thereby allowing for a higher delivery volume and flexibility. 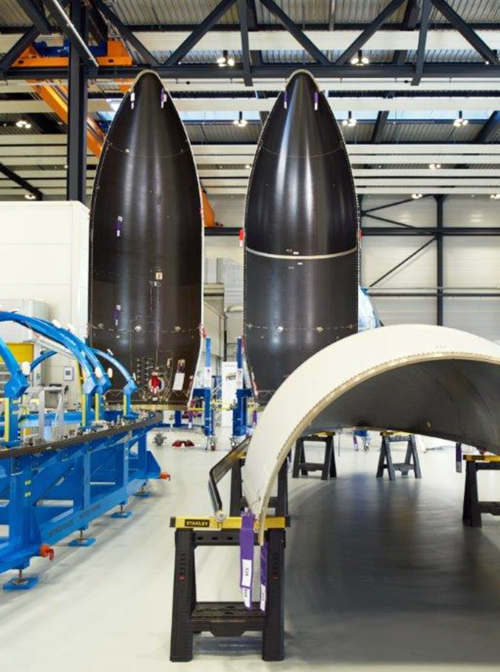 According to the company, with this advanced process, RUAG consolidates the firm's position as the global leader in carbon structures for launch vehicles. In order to run it, RUAG has invested in a state-of-the-art manufacturing hall in Emmen, Switzerland. Relying on tailor-made machinery and automated processes, the new composite centre was inaugurated in 2016. The carbon-fiber based payload fairing consists of two half-shells, which separate in space. These shells are newly cured in an industrial oven instead of an autoclave. This requires less energy, and — thanks to its size — the industrial oven can cure an entire half-shell in one piece. The costly and time-consuming vertical integration of individual shell elements can be avoided. Overall, the Vega payload fairing is 7.8 meter high, and has a diameter of 2.6 meter at its largest point. Due to the out-of-autoclave manufacturing approach the fairing is around 70 kg lighter as the original fairing, cured in an autoclave. Peter Guggenbach, CEO of RUAG Space, stated that the out-of-autoclave process is quite advanced and responds to the needs of today’s space industry. Shorter lead times, less cost, flexible adjustments and higher delivery sequence — this is RUAG's contribution to make access to space more affordable.